« Acupuncture for acute stroke? Perhaps better not! I have read the Tinus Smits book. I’ve also looked at what UK practitioners get up to and it makes for grim reading. My blog has plenty on this. 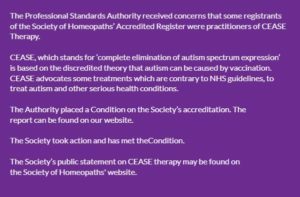 This http://ukhomeopathyregulation.blogspot.co.uk/2018/03/homeopathic-treatment-of-autism.html is a dissection of the book and probably the best place to start but http://ukhomeopathyregulation.blogspot.co.uk/2018/03/the-society-of-homeopaths-fruits-of.html talks about the Society of Homeopaths’ difficulties. Even though they have been reaccredited, the issues of medical neglect remain. The international society of homeopaths do appreciate Ernst’s work in debunking ‘homeopathy’ nonsense. The work that Ernst does saves us a lot of time and bother trying to correct the plethora of delusions. the ‘international society of homeopaths’? perhaps so diluted that they have become invisible? Edzard, the Masons: do they exist; they are invisible except to other Masons, yes? ‘society’ = same as you would use ‘society’ of ‘Britain’. In any case, 99% of homeopathy that you critique is what Hahnemann called the ‘mongrel sect’. But this laborious, sometimes very laborious, search for and selection of the homoeopathic remedy most suitable in every respect to each morbid state, is an operation which, notwithstanding all the admirable books for facilitating it, still demands the study of the original sources themselves, and at the same time a great amount of circumspection and serious deliberation, which have their best rewards in the consciousness of having faithfully discharged our duty. How could his laborious, care-demanding task, by which alone the best way of curing diseases is rendered possible, please the gentlemen of the new mongrel sect, who assume the honorable name of homoeopathists, and even seem to employ medicines in form and appearance homoeopathic, but determined upon by them anyhow (quidquid in buccam venit), and who, when the unsuitable remedy does not immediately give relief, in place of laying the blame on their unpardonable ignorance and laxity in performing the most and important and serious of all human affairs, ascribe it to homoeopathy, which they accuse of great imperfection (if the truth be told, its imperfection consists in this, that the most suitable homoeopathic remedy for each morbid condition does not spontaneously fly into their mouths like roasted pigeons, without any trouble on their own part). They know, however, from frequent practice, how to make up for the inefficiency of the scarcely half homoeopathic remedy by the employment of allopathic means, that come much more handy to them, among which one or more dozens of leeches applied to the affected part, or little harmless venesections to the extent of eight ounces, and so forth, play an important part; and should the patient, in spite of all this, recover, they extol their venesections, leeches, etc., alleging that, had it not been for these, the patient would not have been pulled through, and they give us to understand, in no doubtful language, that these operations, derived without much exercise of genius from the pernicious routine of the old school, in reality contributed the best share towards the cure. But if the patient die under the treatment, as not unfrequently happens, they seek to console the friends by saying that they themselves were witnesses that everything conceivable had been done for the lamented deceased. Who would do this frivolous and pernicious tribe the honour to call them, after the name of the very laborious but salutary art, homoeopathic physicians? May the just recompense await them, that, when taken ill, they may be treated in the same manner! a comment by Greg without any insult whatsoever – or did I miss one? It is a huge affront to the perspective many people who are into ‘homeopathy’ (but no offence intended to any of them personally) and, unfortunately, practice ‘homeopathy’ without knowledge of Homeopathy as explained by Hahnemann. As you and others have shown, ‘clinical homeopathy’ is bogus medicine. The only ‘offence’ to you is implicit: you don’t understand homeopathy. Homeopathy is no secret: it is all in the Organon. Homeopathy is an insult to the intelligence – always and in every line. You keep blurting out the most amusing little vignettes, Greg! Keep them coming Greg. You and Dana Ullmann are the best at illustrating homeopathic thinking. “The Demon Haunted World: Science as a Candle in the Dark” It’s only $12.18 on Amazon for the Kindle version. you seem to have the REAL knowledge about the great method called homeopathy. I have great news for you: The GWUP just put out a challenge to all homeopathy worldwide (so you can and should participate)! You can select WHATEVER remedy you like and WHATEVER method you prefer to identify the remedies correctly. Sounds super easy to me. Best thing is, that the GWUP will pay you 50.000€ if you suceed! If you do not want to take this great opportunity, could you please tell me why not? (I hope your answer does not sound like a cheap excuse…). If you are not into making quick money, please keep in mind that fulfiling this challenge would also most likely lead to one or more nobel prizes! If you are not interested in scientifc fame, please keep in mind that you would immediately become one of the greatest homeopathy EVER (second afer good old Samuel, I would say)! You would also pave the way to great succes for homeopaty and this would then obviously help MILLIONS of sick people! Now please do not tell me that you are not into helping sick people?! You did not. You missed his prayer. Unless you take it literally. Another masterpiece on cognitive dissonance! Well, what a great world it would be if we could decide how it is before discovering how it really is…if ever bothering to, that is. Alan, you also deserve a thanks for working to keep homeopathy clean. The difference between using an idea to set up a business to make money, and practicing or researching homeopathy ethically is perhaps seen now? Half wits like ‘Rita’ might post some statement: how can homeopathy be practiced ethically etc when it is supposedly inherently fraudulent, criminal and balderdash (R. Rawlins)? Something for Rita to consider: how can comments be posted by people on a topic that they have no clue about? Greg: That ‘quote’ broadly captures an important question, but does not quite sound like me. (Richard Rawlins). Reference please. I would not have said ‘supposedly fraudulent’ – if a homeopath sells pills which have no effect, but claims an effect is to be expected – that is fraudulent, and criminal. Perhaps you were quoting a recent poster to this blog I’ve noticed who is styled ‘RRawlins’, but is not me (Richard). I don’t know if my name is being taken in vain or if ‘R Rawlins’ is genuine. Would he/she care to elucidate and avoid confusion? I am the author of Real Secrets of Alternative Medicine . 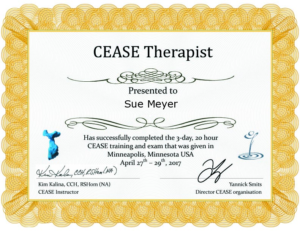 With regards to the link that you provided: Cease – Truth and Misconceptions, it would take a pages to unpick each line of thoughtless words, but I know that you will, so thanks again. No more need be said. Edzard’s critical post of CEASE won’t be any good to promoting CEASE. If ‘CEASE’ ‘therapy’ had managed to cure even one medically confirmed case of Autism, surely it would be front page news, BBC Breaking News, CNN? 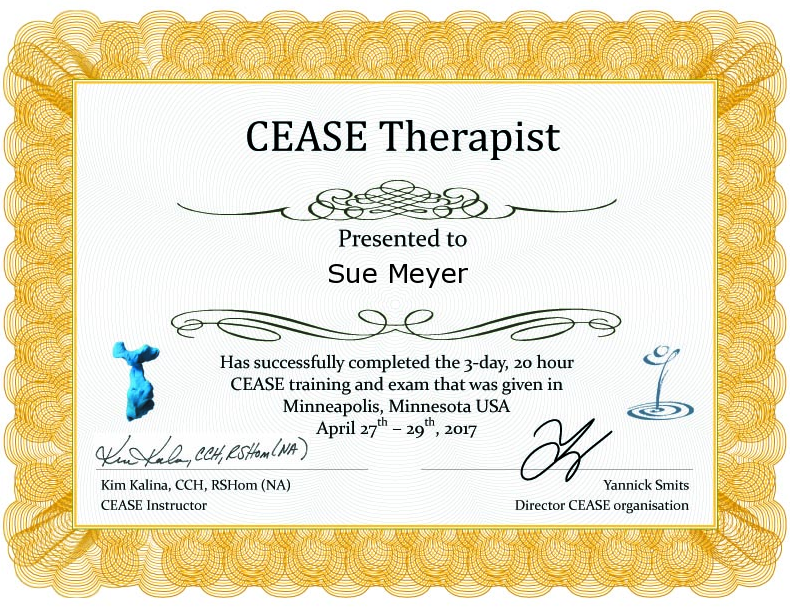 If I have made misstatement regarding CEASE (which I sincerely believe I have not): I would like to see the evidence of a case of CEASE cure of Autism. Does anyone know where such evidence can be located? Don’t think so. Does this refresh your memory Dr. Rawlins? Is Dr. Richard Rawlins biased against homeopaths? Therefore, if it is not certainly known that remedies are pure placebos, why should homeopaths state that they are? Greg: After a lifetime of investigating homeopathy, Edzard should be able to provide a concise ‘head of argument’ for the case against homeopathy. Perhaps he could also try to do this in a dispassionate scientific manner to support his prosecutorial rhetoric: homeopaths are ignorant, corrupt, charlatans, frauds, quacks, criminals, ‘kill your entire family’ (see your listed article above). What if his case is wrong? Perhaps he would not feel any sense of shame for insulting so many people? What if the model and method of ‘investigating’ homeopathy is wrong? I have stated several times on this site that I consider the method (RCT) and model allopathic/clinical homeopathy used in most of the investigations into homeopathy are likely to fail P=F. If someone devises a way to test homeopathy properly and evidence of efficacy is found, what will you say then? Does this law apply in the UK? I was quoting another post. That is why my comment was in quotation marks. I have no idea whether any homeopath is ignorant, corrupt, a quack, charlatan, fraud or criminal. We are dealing here with probabilities and likelihoods, That’s why a proper scientific approach is necessary. Which is more likely, that homeopaths are ignorant, quacks or frauds – or that they have discovered a quite remarkable phenomenon which requires all current knowledge of natural sciences to be set aside? Which do you think more likely? Dr Rawlins: No – nor in SA either. Folks in the categories we are considering here have no dignity which can be impaired. These statements appear inconsistent, please would you clarify, thank you. Sandra Courtney sent Lenny packing, now DR RICHARD RAWLINS, author of “Real Secrets of Alternative Medicine”, has also ‘vanished’. Dr Rawlins, “Real Secrets of English Masons” would be something to read, wouldn’t it? Apologies for not having noticed this post before. A book such as Greg suggests would comprise no more than half a page of A4 paper. Freemasons have no secrets other than the modes of recognition or means whereby they identify other masons. I wish that mainstream medical doctors could stop mislabelling kids with so called autism and provide medical solution to parents of thousands of suffering/medically sick kids . If this would have happened , no parent could have tried alternative methods of treatments including Homeopathy. Unfortunately doctors with big degrees have failed to understand those underlying medical issues . So please instead of blaming homeopathics or naturopaths for making money , go and think about severe failure of medical doctors on topic of so called “autism” epidemic. 1. What credentials do you have that tell us we should listen to what you have to say that overrides the substantial knowledge base that “doctors with big degrees” have accumulated about autism spectrum disorders – why should we take what you say seriously? 2. You say medical doctors have failed severely. Please tell us in what respect they have failed and what you suggest is a solution? I am myself a “kid” wich had my immunological system impaired by vaccines, and my brother even more, and homeopathy saved our lives back in the day. I bet if we had made this CEASE teraphy we qould be even way better now. “This news is hardly surprising” said Dr Richard Rawlins, a member of the BMA’s Council and activist for rationality and integrity in healthcare. “Orthodox medical practitioners have been concerned at the unsubstantiated claims made by homeopaths for more than two hundred years. In 2013, Junior doctors at Glasgow University successfully lobbied to have the requirement they attend modules at Glasgow Homeopathic Hospital removed from their curriculum, and the BMA subsequently established policy that homeopathic remedies should not be provided by the NHS ‘unless and until NICE reports on their cost-benefit’. No such studies were ever done, but the NHS has now ceased prescription of ‘homeopathic remedies’, except in exceptional circumstances. These appear to be where a patient is so emotionally attached to their ‘remedies’ that denial might be seriously injurious to their mental health. How can you say that likes dont cure the likes if you believe vaccines “cures” the illnesses??? Isnt it aplying the virus to combat a possible infection of the same virus? ‘like cures like’ might be correct in isolated instances but it is not a law of nature, as homeopaths claim. vaccines contain active ingredients, whereas the typical homeopathic remedy does not. No Maria, that isn’t really how vaccines work.